HADDONFIELD, N.J. -- In a effort to both raise money for the Hadrosaurus sculpture project and help children understand the importance of savings, HATCH and Equity Bank have launched the "Save-a-Saurus" dinosaur coin-bank program. The coin banks are shaped like hatchling dinosaurs and Equity is offering them free to children at its Haddonfield branch office. Each child signs a pledge (reproduced below) that they will fill the bank with silver coins and bring it back to the bank. 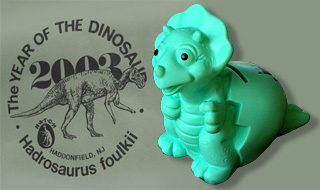 Once returned, the contents of the "Save-a-Saurus" bank are added to the monies being collected by children throughout the area to help fund the project that is now creating a bronze sculpture of Haddonfield's famous fossil, Hadrosaurus foulkii. Then, when the child fills and returns the bank for the second time, Equity will open a saving account with that money in the child's name and contribute $10 more to the new account. The young fundraiser and saver also gets to keep the bank. Banks can be picked up and returned at Equity Bank, Kings Highway and Chestnut st., Haddonfield. With dimes or dollars that I save. So Hadrosaurus can be made. I know that when I return my Save-a-Saurus filled with silver coins to Equity Bank the first time, the money will be added to the money returned by hundreds of other children. I will be helping to buiuld the sculpture of Hadrosaurus foulkii, the famous dinosaur whose bones were discovered in Haddonfield. Once I have kept my promise to bring in my filled "Save-a-Saurus," the bank will be mine to keep. If I fill my bank again, Equity Bank promises to open a savings account for me, with an extra $10.00 added to help me "HATCH" my own future too.